How do you create sympathy for Trump’s spin doctor? Conway might not have sought or welcomed the incessant scrutiny that has accompanied her current position as counselor to the president, but since joining the Trump campaign in July 2016, she has become a veritable television star, an omnipresent internet meme, and one of Saturday Night Live’s most reliable targets. As a longtime Republican pollster and strategist, her area of expertise is spin; her primary skill deflection. Every president has relied on spin doctors, but perhaps none as heavily as Donald Trump, whose tendency to ad-lib, explode on Twitter, and otherwise veer off-message has given Conway weekly, even daily, messes to clean up and information to obfuscate. Sunday morning, however, Conway appeared in a lengthy profile segment on CBS that attempted to both humanize and soften her image, helping to paint her as a mother and wife who’s been made to endure hardship and abuse from left-wing critics and online trolls. But Conway’s image may be beyond salvaging — and Conway may even be laying the groundwork for a potential exit strategy. Unlike a press secretary, who addresses the press corps from behind a stately podium in the White House, much of Conway’s sanitation duties take place in one-on-one interviews, in which she is beamed in from a remote location to comment on, defend, or otherwise blunt Trump’s latest actions, tweets, or executive orders. Since Trump’s inauguration, however, the once-Teflon Conway has made several missteps: most notably, invoking a “Bowling Green massacre” that did not occur and prompting ethics violation concerns with a call for Fox & Friends viewers to “go buy Ivanka’s stuff.” Morning Joe publicly declared it would no longer invite her on their show; CNN and MSNBC have both “passed’ on the opportunity to put her on air. SNL portrayed her as a stalker à la Fatal Attraction; a photo of her kneeling on a White House couch prompted outrage, a mass of memes, and an outrageously sexist joke from Democratic representative Cedric Richmond. The fixer, in other words, has become (part of) the scandal. Such diversions might be part of Conway’s overall strategy — if people are focusing on her snafus, they’re not focusing on those of the man she represents. But Trump himself has shown little tolerance for such missteps: While he likely cares little about, or perhaps even supports, Conway’s call to buy Ivanka’s clothing line, he doesn’t like it when people laugh at him or his surrogates. Getting banned from Morning Joe — until recently a staple of Trump’s daily media diet — reads to Trump as another rejection from the elite political sphere he so craves to be a part of. The shot of Conway kneeling on the couch in the Oval Office, her portrayal on SNL, and the ubiquitous memes undercut the president’s claims to authority, but they’re also embarrassing — and exacerbate Trump’s decades-old class anxieties. While Conway did appear to violate White House ethics guidelines with her comments about Ivanka’s clothing line, it’s important to remember just how skilled she is at her job. Last month, she deftly parried dogged questions from CNN’s Jake Tapper in a 25-minute one-on-one interview that went viral as a spin “marathon.” You might disagree with what Conway does, and to what end, but it’s hard to disagree with just how good she is at it. “Alternative facts” and the Bowling Green massacre are simply the most bold and experimental of the rhetorical weapons in her arsenal. They failed, but dozens of other strategies have flustered even the most practiced of television interviewers. But no matter how good Conway is at her job, she still suffers in comparison with Ivanka, the only other woman in Trump’s inner circle. Both dress, as per Trump’s imperative, “like women” wearing the platinum blonde hair and sheath dress uniform of the conservative set; both espouse and embody the politics of postfeminism. Yet while Ivanka remains publicly silent, “speaking” almost exclusively via her presence at photo ops and social media, Conway’s position requires constant, public speech. Most of that speech has taken place in the form of cable news interviews, which position Conway, again and again, as combatant and aggressor. She’s filmed straight-on, staring both the camera and her interviewer in the eye. The light is often unflattering (as many of her liveshots are outside on the North Lawn of the White House), her makeup unable to cover the bags under her eyes that naturally accompany the life of a woman who’s offering commentary when most are still in bed. Conway recently turned 50; but unlike other women of her age, she has insisted on keeping her hair long, like the conservative women 20 years her junior, and embraces a sort of coy girlishness in her manner. She doesn’t cover her arms or her neck, as older women are taught to do in order to hide “unseemly” wrinkles. Let’s be clear: This shouldn’t be a sin. There are reasons to criticize Kellyanne Conway, but her appearance is absolutely not one of them. Yet in today’s media climate, Conway’s appearance, combined with her visibility, has rendered her not just unruly, but bordering on abject. 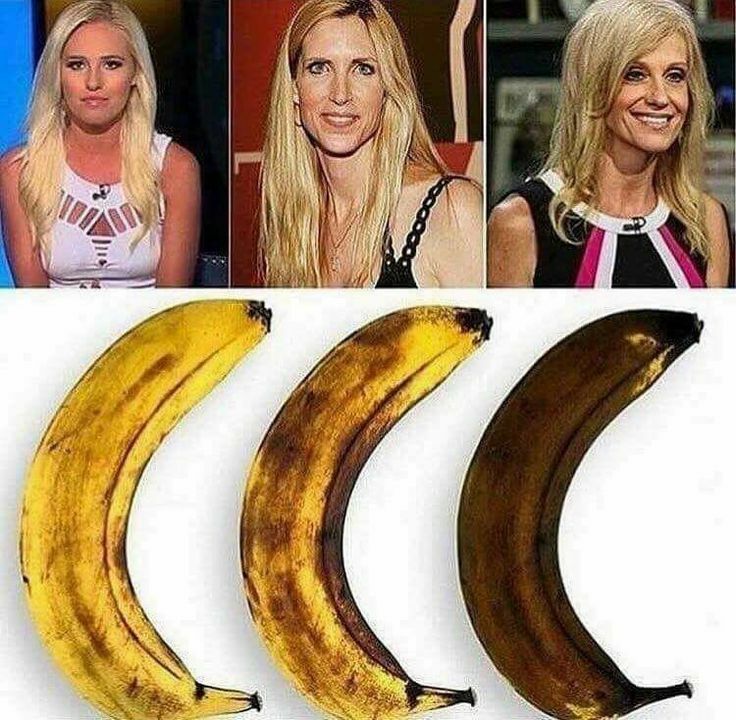 Memes most often compare her to Cruella de Vil, Skeletor, and Golem; one calls her a “Sewer Rat Barbie” while another viral Instagram image compares her complexion to a withered banana. The only woman her age who’s received similarly vicious treatment is, ironically, Madonna. Both Conway and Madonna have become some version of what theorists call “the monstrous feminine” — the woman who chooses not to “act her age,” fails to discipline her body to look younger than that age, or refuses to disappear entirely. Conway has been chastened, in part, for acting, spinning, and possessing confidence like a man — and doing so very publicly. And because Conway, a self-proclaimed Gen-Xer, shies from Ivanka-style Instagram posts, she used the Sunday Morning interview to both re-feminize and re-domesticate herself in the public’s view. In the show’s opener, interviewer Norah O’Donnell proclaims that usually, on a Sunday, Conway would be making the rounds on the political talk shows. Instead, she is going to mass with her husband and four children, then going to lunch at a local diner, then home for a casual hang with her family. For the primary interview, Conway’s hair is smoothed, freshly processed, with gentle waves — a contrast to her frequent White House liveshots, which often catch her looking frenzied in the midst of long and busy days. Her makeup is skillfully and evenly applied; she’s lit warmly and filmed from the side, not straight on. This standard “casual” interview style is a departure from the abrasive straight-on style in which she is usually shot. Throughout the segment, Conway speaks slowly and deliberately; she never interrupts O’Donnell. Instead of the woman challenging the interviewing acumen of a man, now Conway is simply explaining her trials and tribulations to a woman. When O’Donnell periodically interrupts Conway to press for more information, it’s O’Donnell, not Conway, who seems like the aggressor. O’Donnell calls attention to the fact that Conway and her family have Secret Service protection — a rarity for a staff member at her level. Conway responds that she’s been subject to threats and extreme vitriol; she’s been particularly abused on the internet, which she calls “a cesspool.” Interspersed with shots of her children playing at her feet, Conway says that the abuse “hurts my kids more than anything.” “They’re all, ‘Mom, why would people say X about you or Y about you or Z about you?’” In this way, Conway elicits sympathy — while also suggesting that the real victims are her children. Trump has already evidenced his willingness to jettison any non–family member who no longer serves his particular needs — especially one who could seem like an unruly embarrassment. And leaving her job for the sake of the kids — to return to her self-professed “favorite label” as “Mommy” — would be the perfect spin for Trump if he decides to slough off the unruly woman who also happened to be central to him winning the election. President-elect Donald J. Trump kisses the hand of campaign manager Kellyanne Conway at the Indiana Society Ball to thank donors Jan. 19, 2017, in Washington, DC. 1 Lots of people think Conway's personal appearance should be off-limits in criticizing her. 2 And some people affirm that Conway's experiences are partly shaped by misogyny and patriarchy. 3 But others think that Conway's appearance is fair game, given her role in the administration. 5 Writer Anand Giridharadas and many other people think it's a problem to separate Conway's skill from her work. In a long Twitter thread, Giridharadas argues that a "false equivalency" is being created between doing well and doing good.